"Thought to be built somewhere around the 1750s, the Green house on Main Street was owned by Isaac Green in 1846. 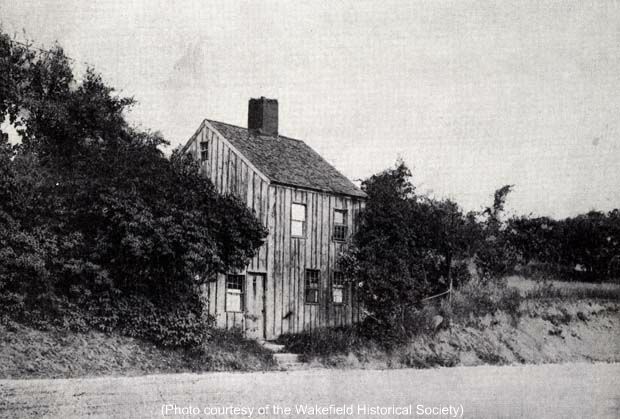 According to the Town of Wakefield finance records of 1846, Isaac Green was paid $38.33 for land to be used by the South Schoolhouse. According to 1876 Polls and Estate Tax records, Isaac owned two dwelling houses, a barn, shed, three to four acres of land, and another parcel of land measuring ten acres, all on Main Street. By 1890, the records indicate that Isaac E. Green owned one-acre with buildings, six acres of woodland, and one dwelling house. Some verbal history records, taken in the 1930s, indicate that some people believed that Greenwood might have been named after the Green family, an important family in the village. These records also indicate that William, David, Samuel, Howard and Thomas Green were important in the village and William Green was among the men who petitioned the General Court in the 1720s to let 10 families become residents of Redding rather than Maldon [sic] (a separate village of Charlestown.) These records also report that Greenwood may have been named by a train conductor for its 'large and beautiful woods.'" -- Text from calendar by Jayne M. D'Onofrio. “Green House, Main Street, circa 1800s,” NOBLE Digital Heritage, accessed April 22, 2019, https://digitalheritage.noblenet.org/noble/items/show/6960.